If you wear your designer jeans to exhaustion, pulling them on every day because they flatter your shape and cost a week’s income, then they’re bound to need repair at some point. Damage can come in the form of frayed bottoms, ripped knees and thinning inner thighs, but this doesn’t mean you should give up on your favorite stretch jeans. With a bit of craftiness (and perhaps some professional service), you can revive your cherished denim. Put on your jeans, and pin the legs where they hit the floor. Do this by folding the excess material under your jeans and fastening the material with straight pins. Ideally, jeans should just brush the ground so they don’t drag and fray. Take off the jeans. Measure to make sure the hem is even all the way around using measuring tape, and mark the new hemline with chalk. Then unpin the jeans, measure and mark 1 inch below the new hemline for a hem allowance, and cut off the excess material using scissors. Save this extra material, since you can use it to patch holes on your jeans later on. Fold a 1/2 inch of your hem allowance over, and then fold it over again. Your raw edge should be enveloped in the denim now. Iron the hem to make it flat. Sew the hem with needle and thread, beginning near the seam and working your way around the leg. Gather the jean scraps from your hemming project. If you don’t have denim scraps, you can buy denim patches from retail craft stores. Or, if you don’t want your patches to blend in, use a different kind of material. Be creative by trying different colors or textures, like cotton or corduroy. Cut your patch so it’s about 1/2 inch larger than the hole on all sides. Sew the patch to the inside of your jeans if you want to keep the hole visible. Do this by pulling the jeans inside out, placing the patch over the hole, threading your needle and sewing the patch over the hole. When you pull the jeans right side out, the patch will be visible under the hole. Sew the patch to the outside of your jeans if you'd rather hide the hole. First, use a cotton swab to apply a small amount of fabric glue around the edges of the patch, fold the edges over and allow the patch to dry; this will keep the patch from fraying once it's been sewn to your jeans. Then, place the patch over the hole on the outside of the jeans, thread your needle and stitch the patch over the hole. Use a phonebook or the Internet to find professional tailors near you. Your local drycleaners may also offer tailoring services. Call or e-mail tailors to find out if and how they repair denim. Ask if they simply hem and patch jeans or if they restore worn denim as well. 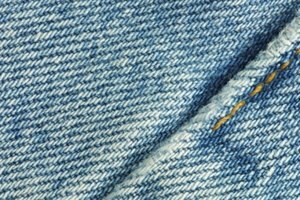 Consider using denim restoration companies like Denim Therapy and Denim Surgeon. Denim Therapy, for example, takes orders from all over the world and mends worn jeans without patching. These companies might be able to restore your jeans to their original condition, but they can be costly. According to London’s "Financial Times," repairs to GAP jeans at Denim Therapy can cost $150 as of 2011. Mail or deliver your jeans to the professionals. Ask how long the repairs should take, schedule a pick up time and pay for your new (old) favorite jeans. Match hemming thread to the seam thread on your jeans. Use heavy-duty needles for best results. Sarah Watson is a Chicago-based freelance writer. She has been writing professionally since 2006, with work appeared in poetry anthologies and literary journals such as "Arts Beat," as well as in various online publications. Watson holds a Master of Arts in education from Northern Illinois University.